As we close off the day, and prepare for the dawn of a new day, here are some great morning devotionals that will energize you for the day ahead: Wake Up to the Word: 365 Devotions to Inspire You Each Day. And if you want it all to be read to you, get the audible version with a 30 day free trail of Audible! You get two free credits that can be used applied to any audible books you desire, which you keep beyond the trial! Heavenly and merciful Father, as we come to the end of the day, I pray that You will spread your protective arms over me and my family. Cover us with your protecting angels and keep us well and safe from all harm and spiritual attacks. Almighty Father, I count myself blessed for the wonderful family members You’ve bound me with, though I may not always appreciate them. Give us peace and love towards one another. Quell the quarreling tongue. Bring us close to each other. I pray for my family members who are not Christians, who have not given their lives to Christ. Bless them, oh Lord, with understanding and wisdom. May they come to know you and have a relationship with you. In Jesus all-powerful name I pray, Amen! 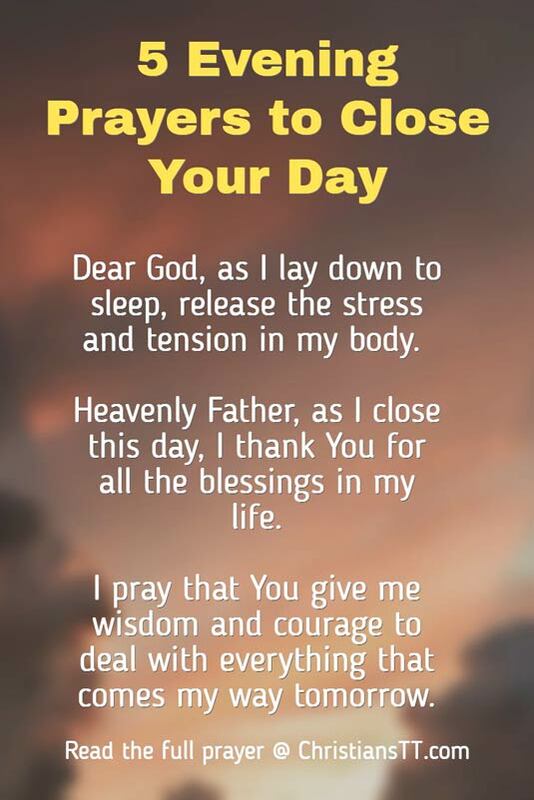 Dear God, as I lay down to sleep, release the stress and tension in my body. Calm my thoughts and remove all restlessness. 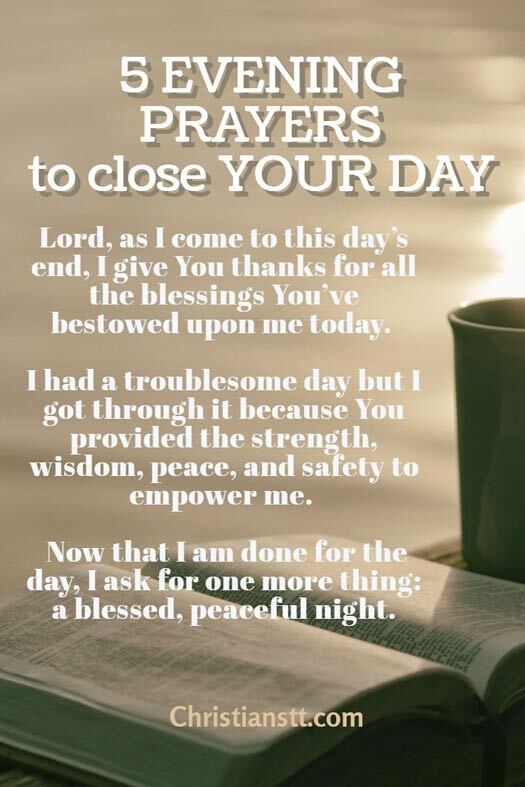 Heavenly Father, as I close this day, I thank You for all the blessings in my life – family, friends, love, hope, and a secure future. I thank You for Your presence in my life, and I pray that You give me wisdom and courage to deal with everything that comes my way tomorrow. Help me to trust You with my life. Direct my steps and let me walk in Your ways. Dear Father, continue speaking to me every moment of everyday. Allow me to know the perfect peace that only You can provide. Above everything, protect my mind and actions so that the enemy might not get through to me. Lord, I pray and ask that You give me the wisdom to deal with my circumstances. Light my path way through the dark tunnel. Grant me restful sleep tonight, in Jesus name, Amen! Lord of Hosts, Gracious Father, and Protector of mankind, I pray to You today for safety and protection. Knowing Your promise to keep us from harm, I believe and trust that my family and myself are safe in Your protective arms. In Your Word, You advise us that the enemy comes to kill, steal and destroy. On my own, I am powerless against such evil but through You I am a conqueror. You promised that whatever we bind on earth, will be bound in heaven. Therefore, I bind all traps that the devil has set on my path. Every harm that he has conjured, I bring down, in the mighty name of Jesus. As for evil intents, I ask You to get them away from my hearing, sight, feeling, thought, touch, and sense. Lord, help us to be aware of wrong thoughts that enter our minds. And, when they do, let us not sit and take the beating from the enemy but we can cast down every wrong thought with Your Word. Lord, I come against every mind-binding spirit and every other evil spirit, in the name of Jesus. Thank You for providing protection and safety even before I asked. 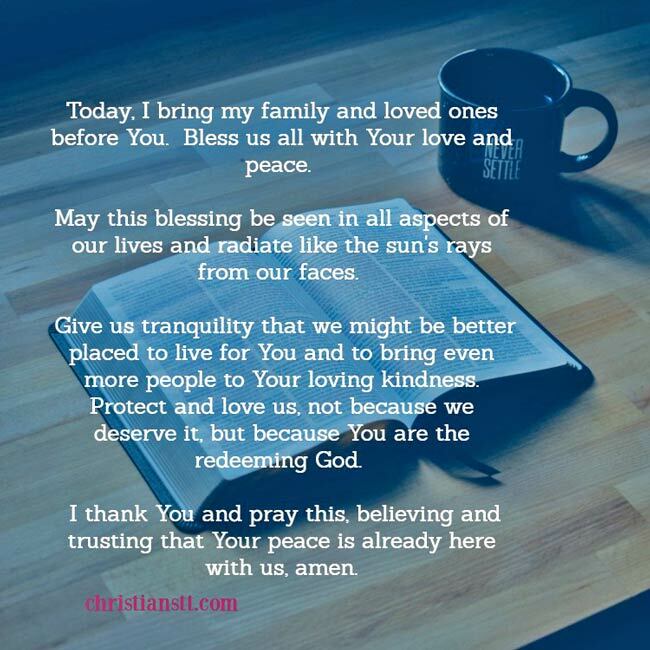 I pray this, believing in Your goodness and love, now and forever, amen. Matthew 18:18 Verily I say unto you, Whatsoever you shall bind on earth shall be bound in heaven. And whatsoever you loose on earth shall be loosed in heaven. Lord God, Yours is a never-ceasing mercy. You called us when we were unworthy and for that I will forever remain thankful. You pulled me from the jaws of evil and brought me into Your loving closure for protection and peace. Lord, as I come to this day’s end, I give You thanks for all the blessings You’ve bestowed upon me today. I had a troublesome day. But I got through it because You provided the strength, wisdom, peace, and safety to empower me. Now that I am done for the day, I ask for one more thing: a blessed, peaceful night. Let me not sin against You in thought or deed. Rather, allow me to spend the time reflecting on Your goodness and grace. Lord, thank You for Your unfailing love and that nothing can separate us from You. Lord, help me to be patience as I wait for Your promises to be manifested. May I not fret or complain, nor even worry, for You have got me engraved in the palm of Your holy righteous hand. Father, thank You in Jesus name, Amen. I pray all this trusting and believing in our Lord Jesus’ name, amen.